MAITLAND, FL— piercegrace’s new book, Days of Noah - Words of Warmth, Wisdom, and Warning!, ($15.49, paperback, 9781498462105; $7.99, e-book, 9781498462112) is a thought-provoking anecdotal and analytical Biblical occasions that include missionary evangelistic journaling of educational, prophetic cautionary Biblical teachable moments and lessons – each guided by the leading of Hand of the Almighty Yahweh and the Holy Spirit. The book’s “flavor” is an evangelizing focus likened to a Noah-event of preaching righteousness to everyone for personal and national Spiritual repentance and redemption toward wellness of body, mind, soul, and spirit. The book is advocating a most timely genuineness of seeking the ways and words of the Almighty Most High and Exalted One while there is still time to do so. For more information about Days of Noah: Words of Warmth, Wisdom, and Warning! Please visit: www.butterflyjourney.org or contact piercegrace (Virginia G. Pierce-Kelly) at piercegrace@gmail.com or (904) 708-8419. 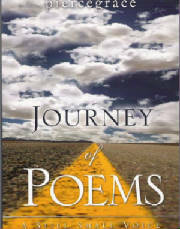 Read Selected Poems from Book - "Journey of Poems - A Still Small Voice"
Titled: "Journey of Poems - A Still Small Voice"
Yahweh Elohim Almighty has given me additional books that He desires for me to write and publish as He directs by His hand. Words of Warmth, Wisdom and Warning"
Titled: "COLORS of the WINDS"
Title: "Dancing Clouds: Evangelism from Georgia to Montana"